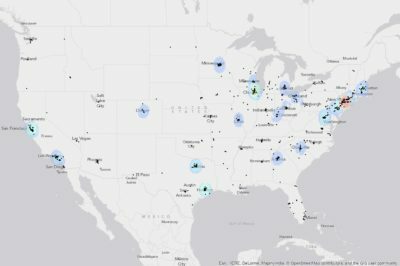 Heat map showing clusters for Fortune 1000 companies. Hawaii and Puerto Rico are not shown. Click on the map for a larger image. The 2014 listing of Fortune 1000 companies were mapped out in order to understand the answers to such questions as which states have the most Fortune 1000 companies and where are there geographic clusters of Fortune 1000 companies. This table shows the total number of Fortune 1000 and Fortune 500 companies by U.S. state and territory (Puerto Rico). The list can be sorted by state, number of Fortune 1000 companies, and number of Fortune 500 companies. A list of the total number of Fortune 1000 by urban area as defined by the US Census Bureau. The list can be sorted by urban name, total number of Fortune 1000 companies, and by 2010 population.